BROOKLYN, N.Y. (CNS) — Simple acts of accompaniment communicate the Christian message of hope, said Cardinal Joseph W. Tobin of Newark, New Jersey. He was the keynote speaker at DeSales Media’s celebration of World Communications Day in Brooklyn May 17. Held at BRIC House in the downtown area, the daylong conference brought together about 250 people involved in both the religious and secular media as well as interested parishioners. 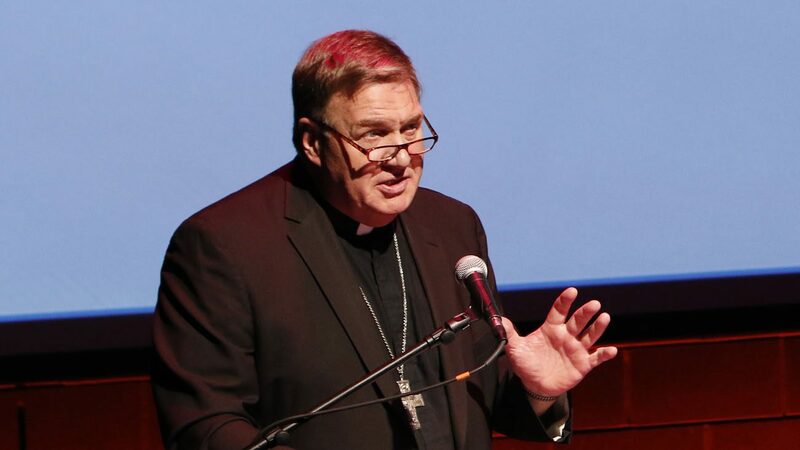 To illustrate his point, Cardinal Tobin used a well-publicized incident when he accompanied a poor Mexican immigrant who was threatened with deportation to the federal courthouse in Newark. He prayed with members of other faiths alongside Catalino Guerrero, a 59-year-old grandfather who was in the country without legal permission but had never been charged with any crimes and who suffered from diabetes and heart disease. The cardinal said he does want to make the media into a punching bag, but he added there were some glaring deficiencies in the news industry that demand attention. The media, he said, “doesn’t always report the facts straightforwardly,” instead opting for the spectacular “if-it-bleeds-it-leads” approach. He felt that the push to get good ratings to earn advertising revenues and the challenge of maintaining the 24-hour news cycle can compromise reality with the spectacular. He felt that news coverage relies more on opinion and less on facts. He also pointed to the “fear-based” coverage of events that causes hysteria and stirs controversy rather than simply reporting the facts. To counteract the “facelessness” of the poor and forgotten, Christians, he said, are called to communicate the Gospel of Jesus by simple acts of compassion. “Accompanying Catalino Guerrero was simply an act of compassion on my part,” he said. “But to many it was a symbol that communicated hope and a sign that the Church does not live in some ivory tower. “Standing beside and praying with Catalino Guerrero and his family, speaking to the media about it, were actions taken together that provided a lens through which other might see this event,” he said. The program also featured a panel discussion on “Fact or Fiction: Journalism’s Last Stand?” and an exclusive screening of “Sacred,” a new faith-based documentary, followed by a question-and-answer period with the filmmakers. DeSales Media Group is the communications agency of the Diocese of Brooklyn that publishes The Tablet, the weekly diocesan newspaper, and maintains NET-TV, a 24-hour cable station in the New York City area.